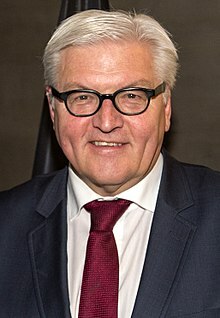 Frank-Walter Steinmeier [ˈfʁaŋkˌvaltɐ ˈʃtaɪ̯nˌmaɪ̯.ɐ] (born 5 Januar 1956) is a German politeecian o the Social Democratic Pairty o Germany (SPD) wha is the Preses o Germany, takin office on 19 Mairch 2017. He previously served as Meenister for Foreign Affairs frae 2013 tae 2017. Steinmeier wis a close aide o Chancellor Gerhard Schröder, servin as Chief o Staff in the German Chancellery frae 1999 tae 2005. He subsequently served as Foreign Meenister (2005–2009) an Vice Chancellor (2007–2009) in the grand coalition govrenment o Angela Merkel. In 2008, he briefly served as actin chairman o his party. This page wis last eeditit on 10 Mey 2018, at 01:29.